We were reading through some of our older newsletters and came across the massive Aggie ring built by Blue Genie Art Industries and were so impressed we decided to share it with you again. 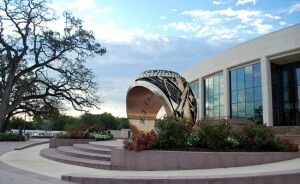 Constructed using Precision Board Plus PBLT-8 as a mold, this 12 ft. tall ring was made to be placed at the entrance of the Alumni Center at Texas A & M University in College Station, TX. In order to cut the mold out on their 3-axis CNC mill, Blue Genie used a drawing provided by ring maker Balfour to scale up the design while maintaining the detail. VisualMILL software was used to create tool paths for the milling machine to follow. Pieces of PBLT-8 were then assembled in sections and bonded to a custom 8′ diameter steel-fabricated armature to create the model. The project was then turned over to Deep In The Heart Art Foundry of Bastrop, TX for the bronze casting and fabrication of the 6500lb. Aggie ring replica. According to Clint Howard, Deep In The Heart Art’s President: “compared to other big projects we’ve done, this is technically the most challenging piece when it comes to surface finish.” Although the ring was cast in sections and then welded together, all the effort put into grinding and polishing makes it appear that the giant ring was cast as one solid piece. After all, the larger than life example had to live up to the symbols of integrity, achievement, power and valor, which are just a few of the many traits the ring has come to represent to Aggie alumni. As an inspirational gesture, a time capsule was fabricated into the bezel of the ring, which will be opened by alumni in 50 years.